Groundwater Use in the U.S.
Fresh groundwater was used for many important purposes, with the largest amount going toward irrigating crops, such as the delicious eggplants, squash, and rutabagas that children love to have for dinner. Local city and county water departments withdraw a lot of groundwater for public uses, such as for delivery to homes, businesses, and industries, as well as for community uses such as fire fighting, water services at public buildings, and for keeping local residents happy by keeping community swimming pools full of water. Industries and mining facilities also used a lot of groundwater. The majority of water used for self-supplied domestic (people who supply their own home water, usually by a well) and livestock purposes came from groundwater sources. Data are rounded and are reported in million gallons per day (Mgal/d). Each green cylinder represents a category of water use. The industrial cylinder, for instance, shows how much groundwater, surface water, and total water was used in the United States, each day, by industries. You can see that although the Nation uses much more surface water than groundwater, groundwater has significant importance for some of the categories. Almost all self-supplied domestic water came from groundwater; over 40 percent of irrigation water was groundwater; and more groundwater than surface water was used for livestock purposes. Of the total fresh groundwater withdrawals nationwide (82,300 Mgal/d), irrigation accounted for 70 percent, primarily in California, Arkansas, Nebraska, Idaho, and Texas. Fresh groundwater irrigation withdrawals in these five States cumulatively accounted for 46 percent of the total fresh groundwater withdrawals for all categories nationwide. 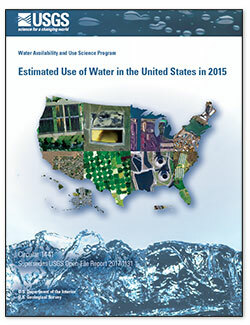 Nearly all groundwater withdrawals (97 percent) were from freshwater, predominantly used for irrigation. Saline groundwater withdrawals were predominantly used for mining (80 percent) and occurred in Texas, California, and Oklahoma. Irrigation used greater than three times more fresh groundwater than public supply, which was the next largest use of fresh groundwater in the Nation. 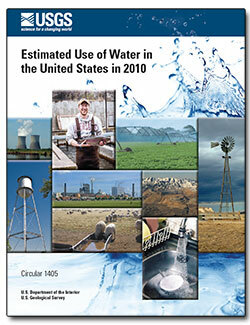 Below are science topics related to groundwater use. Below are publications related to groundwater use. Below are multimedia items associated with groundwater use.